By Brad Antoniewicz and Tushar Dalvi. At Recon 2012 Travis Goodspeed and Sergey Bratus released the Facedancer, an extremely flexible piece of hardware for emulating and tinkering with USB devices. Although the Facedancer is very much it's own device, it evolved from another one of Travis Goodspeed's projects, the GoodFET, which is his own customized Flash Emulation Tool debugger for the MSP430 microcontroller. The PCBs for each device can be ordered online however, the devices are not currently available pre-assembled. 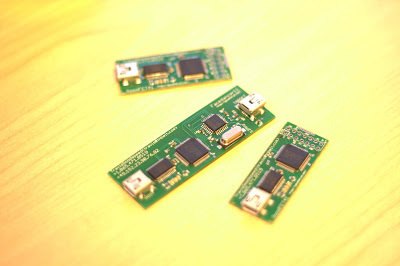 So if you want to play with them, you'll need to learn how to solder! Although some may see this as a pain, I personally love it and hope assembled boards are never released - it forces people to learn the fundamentals of what they're doing. I've done almost no surface mount soldering before and have always wanted to play with USB so the Facedancer was a perfect project for me. 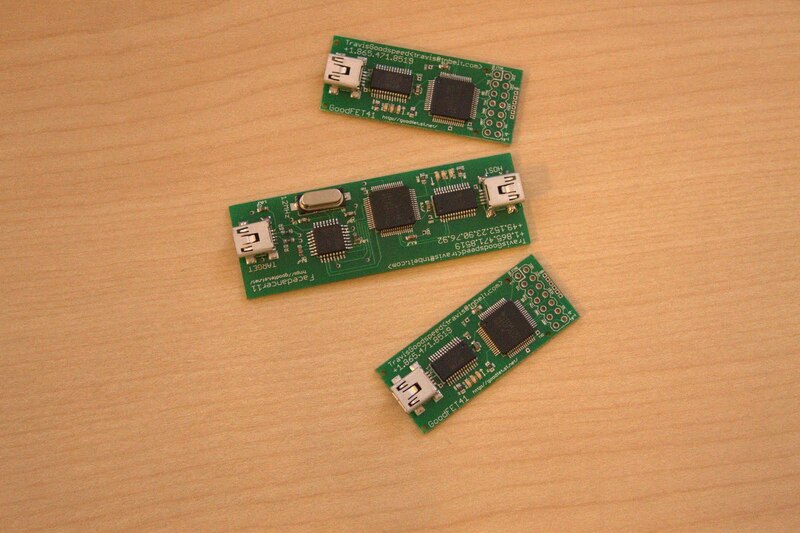 Although I don't have much use for the GoodFET, two were generously included within my shipment, so I ordered the spare components and built them too. Both the Facedancer and GoodFET include a parts list on their description pages but when you go to order them from any supplier, you'll quickly realize there are a seemingly endless combination of options to choose from. After spending some time putting together an actual order, I jumped on #goodfet and asked for a little help. Luckily the channel is populated with hardware rock stars like Michael Ossmann and dragorn who were kind enough to help redefine my order, pointing out corrections to the online parts list that weren't published yet and alternate crystal options. Throughout the entire assembly process, these two defied standard irc help channel etiquette by offering extremely useful tips and troubleshooting suggestions - These guys ROCK! In the end, here's the detailed part list I used. Everything was ordered from DigiKey, since that's were I bought my first 6.5535MHz crystal. I made a reddit post, just in case you want to add any updates. Soldering Iron. One of the biggest things is to get a good soldering iron - leave the crappy radio shack one on the shelf and get one with temperature control and a fine tip. I went for the Weller WES51. Flux! You won't understand how amazing this is until you use it. Then you'll question what the heck you were doing without out. I used the RadioShack stuff. Its messy, dragorn recommended ChipQuik No Clean Flux. Head mounted magnifier - There's probably a more official name for this :) It was extremely useful to have a head mounted magnifier over those stupid helping hands. I bought this one. Tweezers - Impossible to place surface mount capacitors without these guys. I used the Wiha 7a SA-ESD, which I think these are close to. Tip Cleaner. This helps keep the tip clean and help with spreading the solder when its dirty and needs to be tinned. This is the Hakko 599B. Desoldering Braid - Helps when you mess up. So much easier to when you use a little flux with it. I used the RadioShack stuff. Solder - I used the RadioShack's 0.022" solder, that they don't have on their site. I wanted to try out the hot plate reflow technique because it looked really easy and seemed like a fun way to get everything done quickly. I also came across another great blog post showing how someone else used it for an earlier GoodFET, which helped me make my decision. Overall, I feel like hotplate reflow is cool but I don't know that it was really needed. I sort of cheated by running a super thin line of paste down across all of the pads on the PCB rather then being more precise with a toothpick. Since the paste didn't flow smoothly out of the syringe, I ended up getting uneven globs which eventually turned into bridges once the reflow completed. To fix the bridges, I ended up drag soldering (which is one of the most popular ways to hand solder surface mount components) so I could have probably just skipped the hotplate entirely. Also, the hotplate temperature is pretty hard to control, after completing the first board it took a long time for the plate to decrease in temperature, I got impatient and threw on the next board which put me pretty close to frying everything. Once I had everything assembled, I connected it to my system and discovered the FT232R chip was not being recognized. I used the audible continuity tester on my multimeter to debug the issue. Starting from the host side USB connector, I tested the paths between the connector and the FTDI input pins which quickly revealed I had a small solder bridge. I used a some flux with the desoldering braid to clean it up and then drag soldered it a little more to make sure I had a good joint. After that I gave everything a close inspection under magnification again and noticed a couple more tiny bridges. As I removed them, I accidentally broke one of the pins off of the MSP430. Normally this would be an issue, but since the pin wasn't used, it was ok to leave it alone. I reconnected the Facedancer to my computer and it worked! Once everything has completed, just run a quick test to make sure nothing is broken! I also had a lot of trouble doing hotplate reflow while assembling a facedancer; the board warps badly and it's hard to get an even heat distribution. Drag soldering is definitely the way to go with these.